The Cabanas personify the ideal tropical island beach. We are far away from the noise and bustle of Waikiki, yet close enough to go and visit if desired. The Cabana's is possibly the best kept secret in Hawaii. 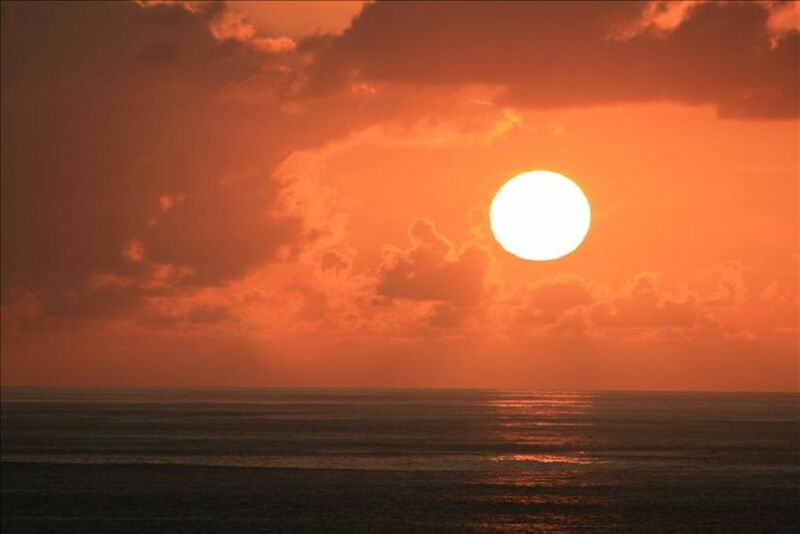 From your lanai you will view what many consider one of the most beautiful sunsets in the world. No other vacation destination gives as much beauty and tropical ambiance for the dollar. Our unit offers as close to a gourmet kitchen for preparing delicious meals to enjoy during the sunsets. If you need a break from the beach, your just steps from enjoying a tropical drink on your shaded lanai and watching all the the fun and sun from a short distance. You can enjoy the privacy of being above beach level while knowing that if the elevator is taking its time, you are only a few quick steps from the ground floor. Don't forget to ask about a completely private sailing charter aboard our 38' Sparkman and Stephens designed Catalina Yacht. Because of this unit's unique location, you can watch the sunset from your lanai or your bedroom. This unit is located directly on the THE BEST swimming beach on the island! This unit has private high speed WiFi internet. We had a great time Oahu. The beach was beautiful and so convenient. My grandkids loved it. This is a second story cabana with the porch view of ocean. The beach is private. The parking, main entrance and elevator is secure by RFID security FOB. There are couple of places to eat within walking distance. The establishment is clean and maintained well. I was here a month for work and enjoyed the fact I could decompress every evening watching the sun set. Everything worked in the cabana which allowed me to work more effectively. Recommend for short and long term stay. Nice condo, superb location. Laina right on the beach, 80 feet away. Kitchen is small, but who cares, you are in vacation. Kriss was there to answer any questions, good communication. Very nice sandy beach and great view from the lanai. The beach is sandy and swimmable. It was nice to get out and swim in the morning and night. Spent the rest of day out around the island. Clean and updated kitchen and bathroom. We had everything we needed and had a nice stay. It was in the upper 80's during our stay and the condo was cool and breezy. The sound of the waves will put you to sleep in minutes. Kriss was helpful and accommodating. Staff were friendly and helpful. We had a very nice stay and would return. Always enjoy staying at the cabanas!!! And enjoyed staying at this cozy little unit for my yearly trip!!! The sound of the ocean waves right next to you as you sleep is something else!!! Can’t wait for next time already!!! So glad you had a great time. We are looking forward to your return! Our third time staying here. Hope to come back soon!! Hope to see you again Joe!